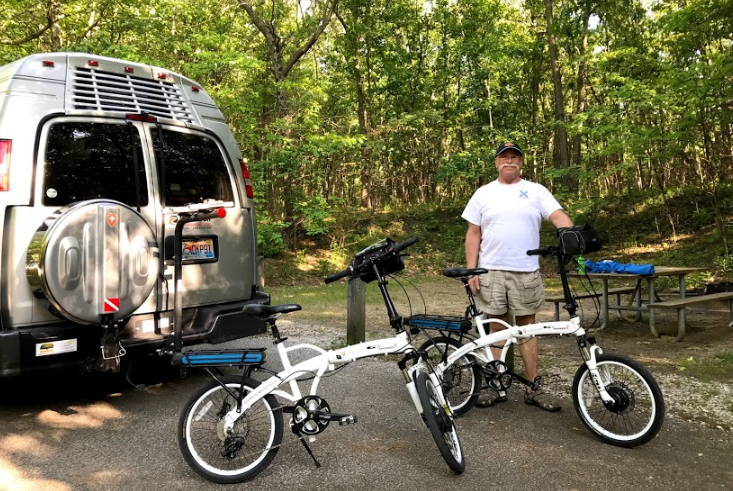 From June 6-10, we were at the Glamarama RV rally in Allegan, Michigan. There were around 300 RVs there, but we parked in a section with just the Roadtreks. This is great because the President of the Roadtrek chapter of FMCA, Sherry Targum, makes sure that we have a space for group happy hours, and she "Pours at Four." Jim and I fit right in! We were here to teach. We taught 4 seminars: Google Photos, Smartphone Basics, Technology for Travelers, and Create your Online Travelogue. Jim also took some drone video of the fairgrounds with all the RVs here. Part of our "Create your Travelogue" seminar teaches how to embed that video in a blog post, just like this! We had a few days in between rallies, so I used the Roadtrippers app to find something fun to do. The Lincoln Presidential museum was right on the way. 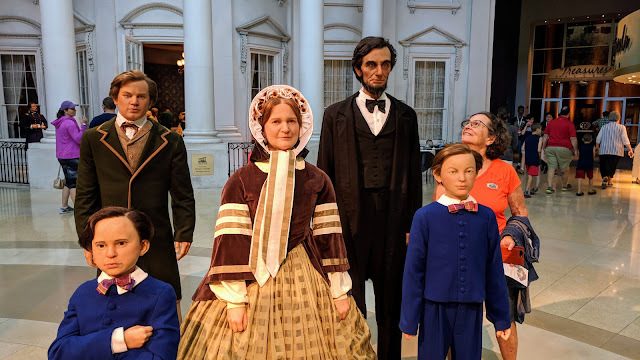 We've been there before (we've been to ALL the official presidential museums, but Lincoln's was one of the best, and we were happy to visit again. We found a fairgrounds RV park within bike-riding distance. Cool! This animated exhibit makes it appallingly clear how many people died during the Civil war. I don't know how Lincoln could sleep at night, and he was already prone to depression. We had fun with our cool little electric bikes. Thoroughly enjoyed the Lincoln museum, and found a great little place for lunch. Our site was walking distance to Lincoln's tomb, so we did that too. And, just hanging out at our site was nice. Notice the cell tower in the background? So did we! Blazing fast Verizon internet, so we decided to hang around one more day and do our What Does This Button Do? show from outside the RV. Over the years of traveling by RV, we've evolved. From wandering, to sightseeing, to working on the road. 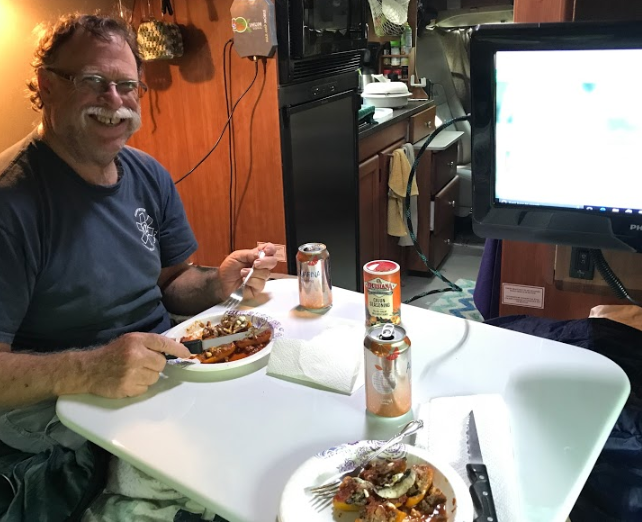 This summer, my husband and I - as GeeksOnTour - are on the road for 5 months and are booked to give seminars at 7 different RV rallies. As we travel, we are making our living from our website. 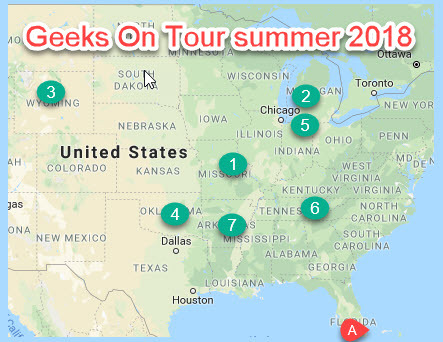 We've grown into our name - this summer we are Geeks On Tour more than ever before. Check out our map above. Fort Lauderdale, Florida is home. "A" on the map is where we start and stop. 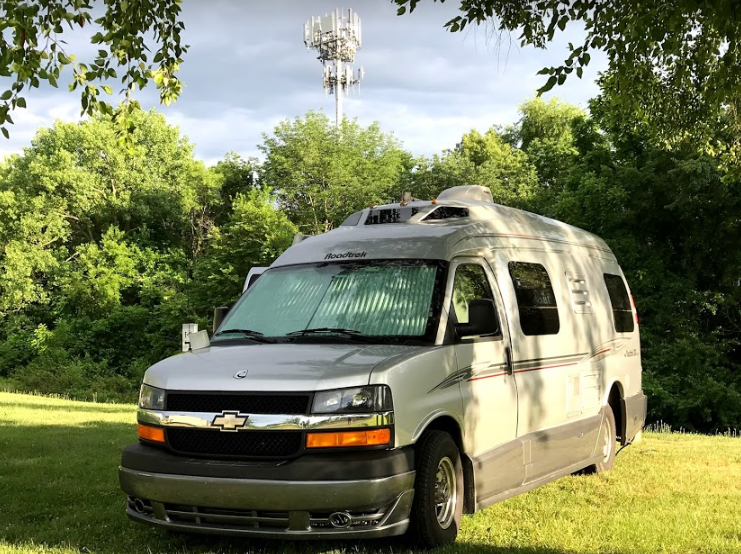 Our transportation, home, and office is a camper van made by Roadtrek. 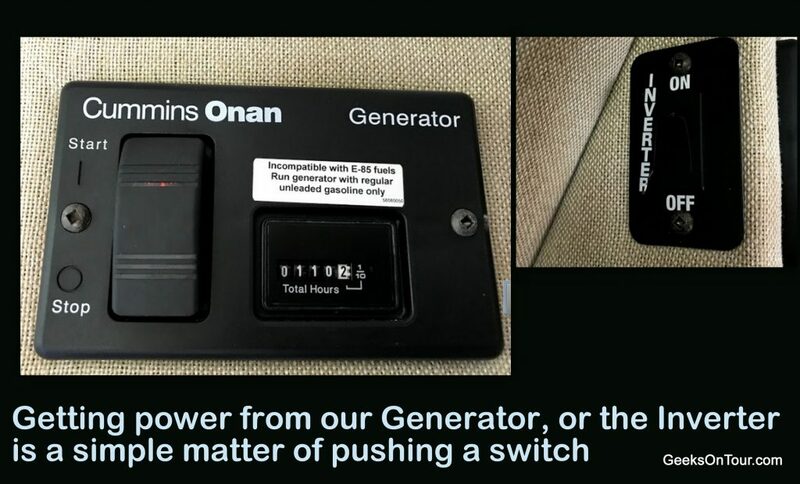 Generator: as long as we have over 1/4 tank of gas, we can turn on the generator and have as much power as we need. Just as if we were plugged in to shore power. Coffee maker, A/C, hair dryer - everything. What about water and sewer? We have holding tanks for that. When our fresh water tanks are full and our black and gray water tanks are empty, we can live comfortably for about 5 days. We've gone 7-8 when we have use of a bath house. Ahh - there are entire books written about that! I'll just give you our short answer. We have a Verizon unlimited plan on our old Samsung phones. We turn those phones into hotspots so our computers can connect. Here's our video on how to do that. If you look closely at the first photo above, you'll see a cell tower in the distance behind our Roadtrek. That's what we like to see! We had screaming fast Verizon Internet there - 60Mbps down/37Mbps up! We even had enough connectivity to do our live YouTube show from that location - see Episode 144. Even at the Dunes we had good speeds, 10-20 Mbps. Here's an article to learn more about Internet speeds. Rarely do we find a location in the US where Verizon doesn't give us at least enough check email or post to the website. If we do find ourselves in such a place, we also have T-Mobile service we can try or Project Fi from Google. If nothing works, we can't stay! There you have it, whether we're in our house in Fort Lauderdale, or in our Roadtrek working on the road, it makes no never-mind to us. We have everything we need. Let the tour continue!